Its hard to believe that there is only one week left of March and that we have taken no walks at all this month. The first two weeks were miserable in the extreme with storms, high winds and constant rain, not the sort of weather you really want to be walking in. This week the wind has been much quieter and the temperatures a little better but it hasn’t been any brighter, plenty of overcast skies with only rare glimpses of sun. Quite apart from the weather the arrival of March coincided with, for myself, the onset of a very unpleasant and very debilitating viral infection in the upper respiratory tract, medical terminology for a head and chest full of thick wet cement and the inability to breathe satisfactorily, complete with all the accompanying side effects, and generally feeling like death warmed up. All of the above are still present and likely to be with me for another couple of weeks at least, according to the doctor. She’d had it too and it was four weeks before things got back to normal, leaving her ‘whacked out’ as she described it. Anyway it is what it is and, as antibiotics aren’t prescribed for viral infections because they don’t work on a virus, all I can do is put up with it all and wait for it to pass. Having been stuck indoors, more or less, for all this time I thought a steady and reasonably gentle walk might at least brighten my mood so we decided on a simple stroll through Troutbeck Park and then over to Troutbeck Tongue, always assuming I could muster enough breath to walk up the gentle slope at the northern end of it. J has not been affected by it in any way so if necessary he could always drag me up if I couldn’t do it under my own steam. 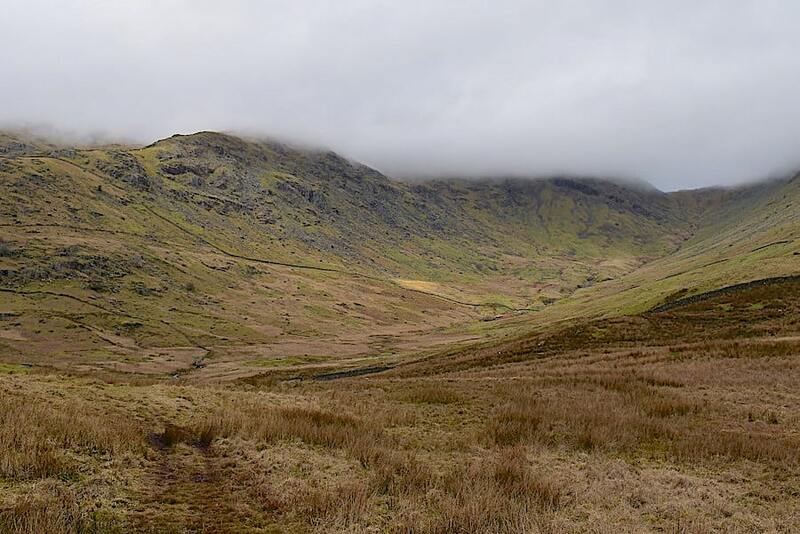 As you can see it wasn’t a day for the high fells even if I had been fit enough to tackle them. 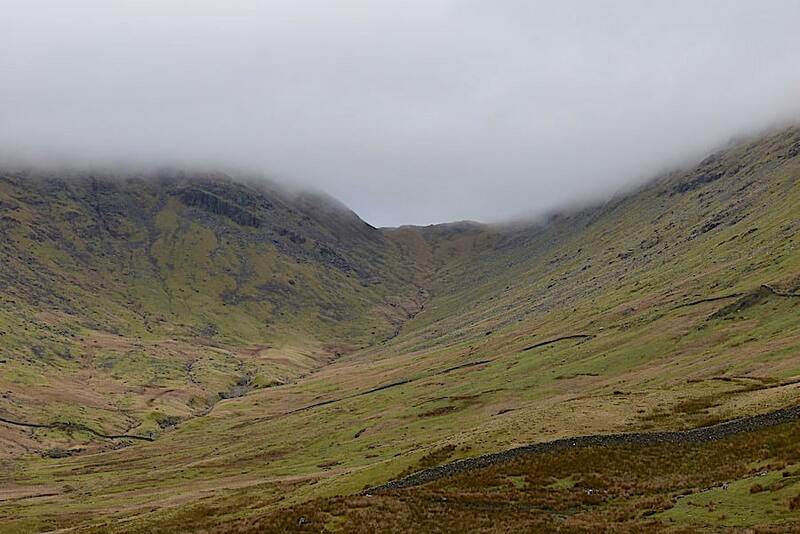 Low cloud everywhere, with only the fells of more modest height escaping its damp, clammy clutches. From the A592 lay-by I took a look across to Troutbeck Tongue behind which Yoke, Ill Bell and Froswick are normally on view, but not today. The lay-by where we had parked is roughly half a mile up the road behind me so it didn’t take us long to arrive at the little hamlet of Town Head. 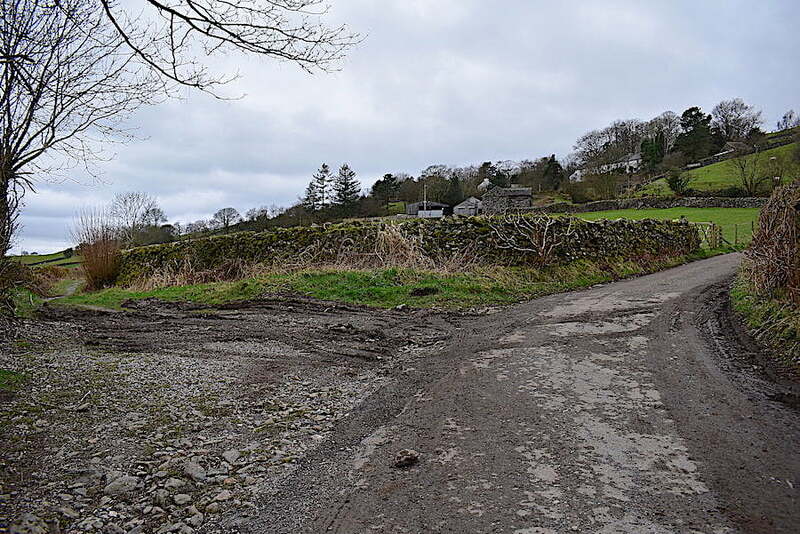 There is no footpath/pavement on either side of the A592 so you do have to keep your eyes and ears peeled. Fortunately it wasn’t busy today so we had a relatively straightforward walk down. 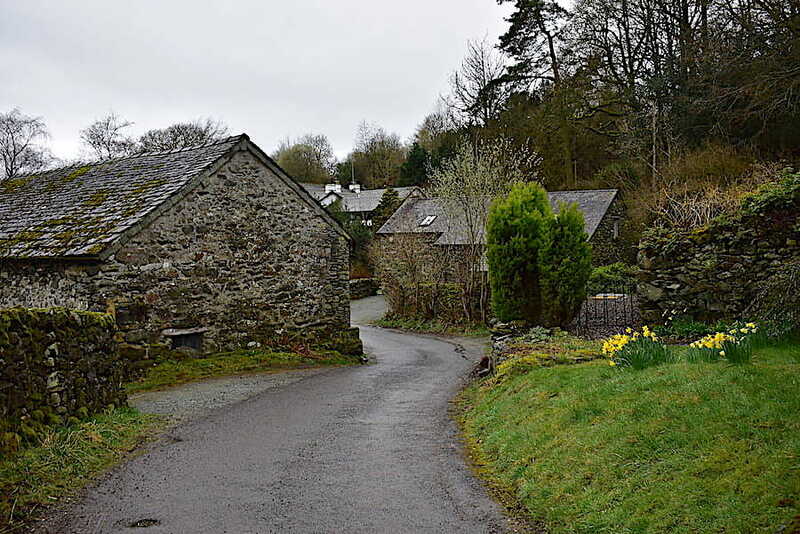 Here we turned off left into the peace and quiet of Town Head …..
….. where the banks of daffodils and the fresh green shoots on trees and hedgerows brightened up a very grey day and reminded us that spring has definitely arrived. Residents of Town Head seemed to have decided that the best place was indoors today because we didn’t see a soul as we passed through. 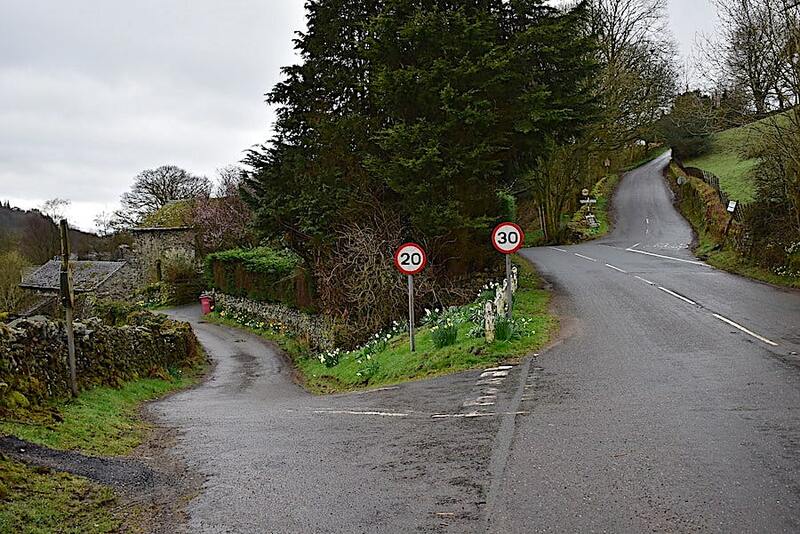 We turn the corner and drop down the hill to …..
….. Ing Lane. The sign might look a little off-putting but the small print says you are free to use it provided you are on foot or on horseback. Being in the foot category we meet the prescribed requirements so off we go and carry on walking down into the valley. A pleasant and easy saunter along Ing Lane as we make our way along the valley bottom. There was a complete absence of any movement of air so the valley was very quiet and still, and the low blanket of cloud kept the atmosphere feeling very close and muggy along here. 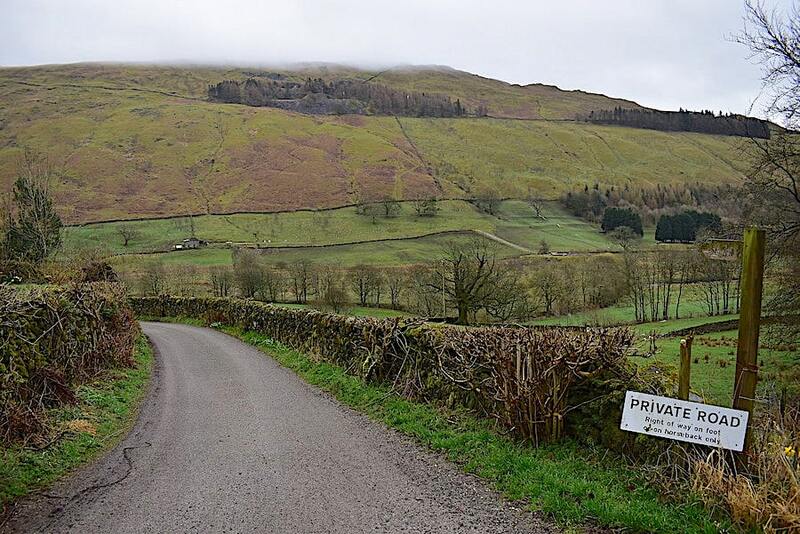 Up ahead, on the right, Troutbeck Tongue has come into view. As we cross Ing Bridge though the skyline view on the opposite side of the valley is still blanketed by the low cloud. 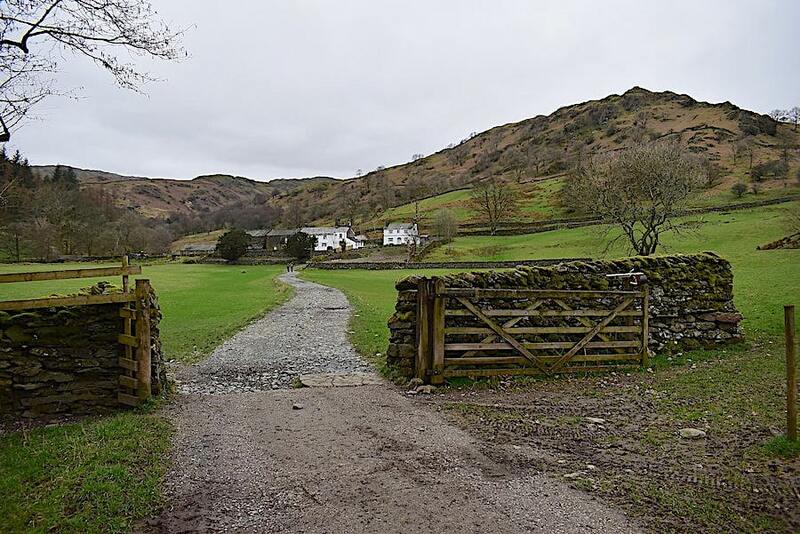 We’re well beyond Ing Bridge and Hagg Bridge now and nestling at the foot of the Tongue’s southern slopes is Troutbeck Park Farm, which was bought by Beatrix Potter in 1923. 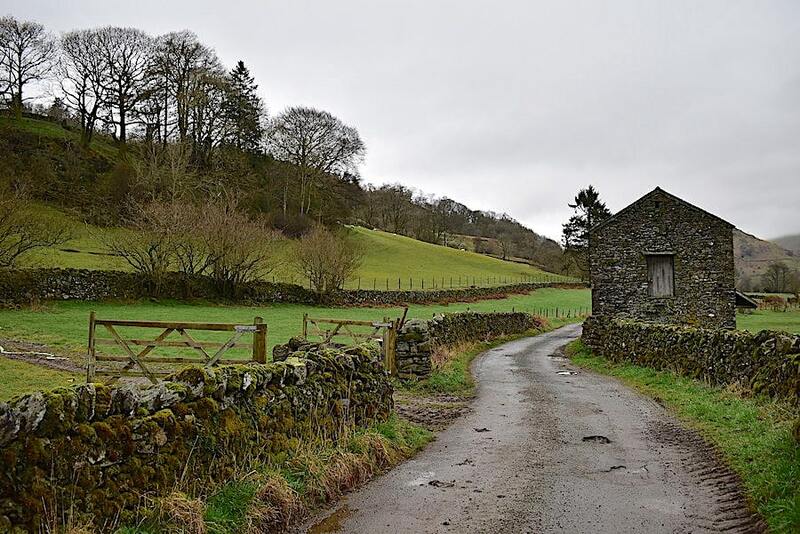 A large farm of some 1900 acres, and at the time threats to traditional upland farming came from the Forestry Commission, which had proposed planting conifer woodland on many of the agriculturally ‘low value’ (in their opinion) upland areas to fulfil the national need for timber. 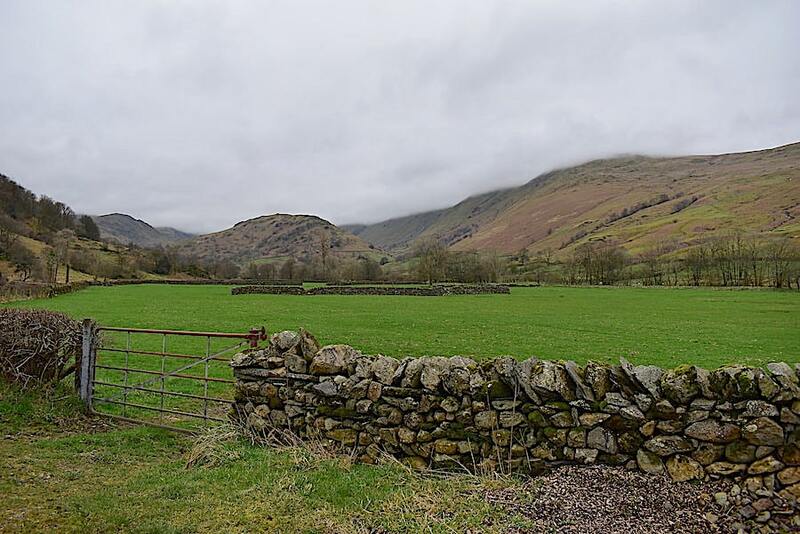 This was land which provided upland grazing for several farms in the district and of course the proposals were not met with unbridled enthusiasm. Beatrix wanted to keep the farm as a working concern so she bought it, lock, stock and barrel and the would be developers were seen off, presumably with much muttering under their collective breaths, and perhaps feeling more than a little indignant at having been out manoeuvred by a woman. Not quite what men were used to in the 1920’s that’s for sure. 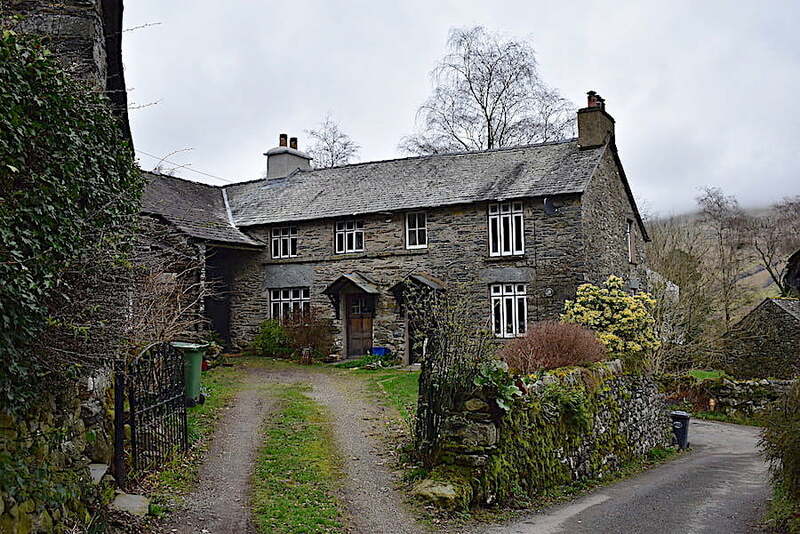 Three years after buying the farm Beatrix decided to run the farm herself, with the help of a shepherd, George Walker, and the building to the right of the main farmhouse is the house she had built for George and his family to live in. 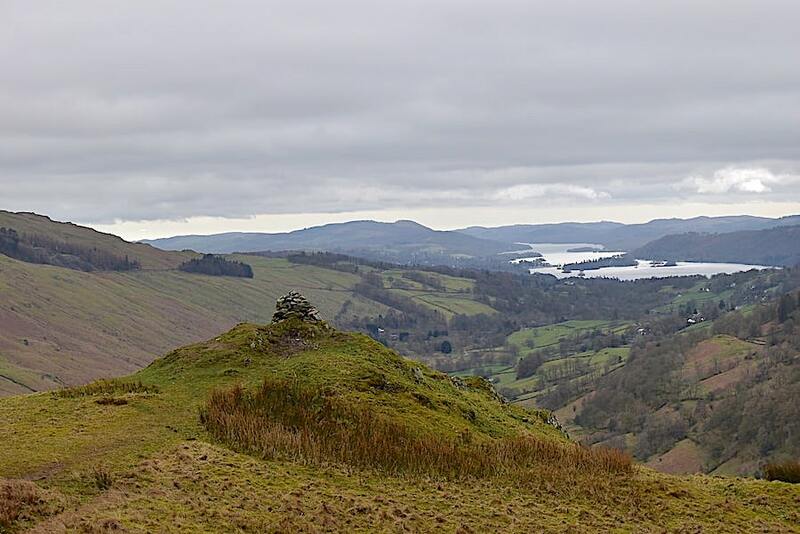 Troutbeck Tongue from the now largely superfluous stile. Should another outbreak of foot and mouth disease occur an electrified wire could still be threaded through the yellow trunking attached to the upper bar of the stile. 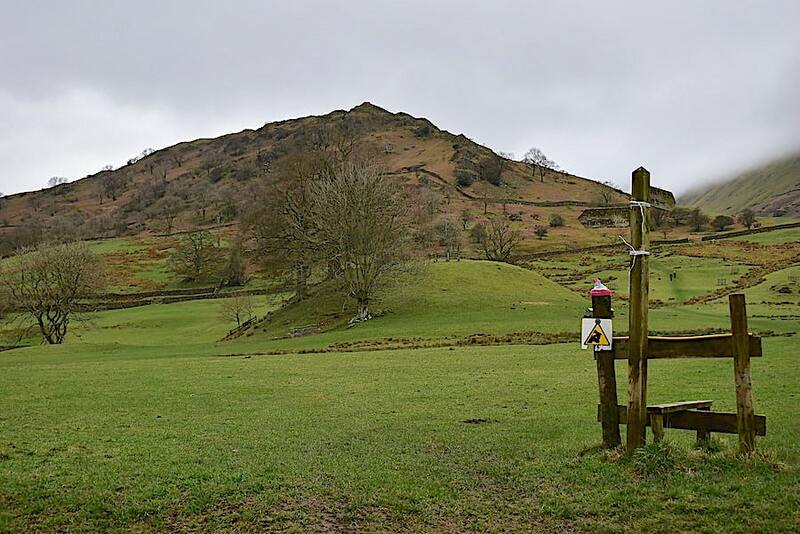 We crossed the rising ground over the very wet field and made our way up to the gate in the wall, beyond which we were looking forward to getting our boots onto a drier and much firmer path once again. 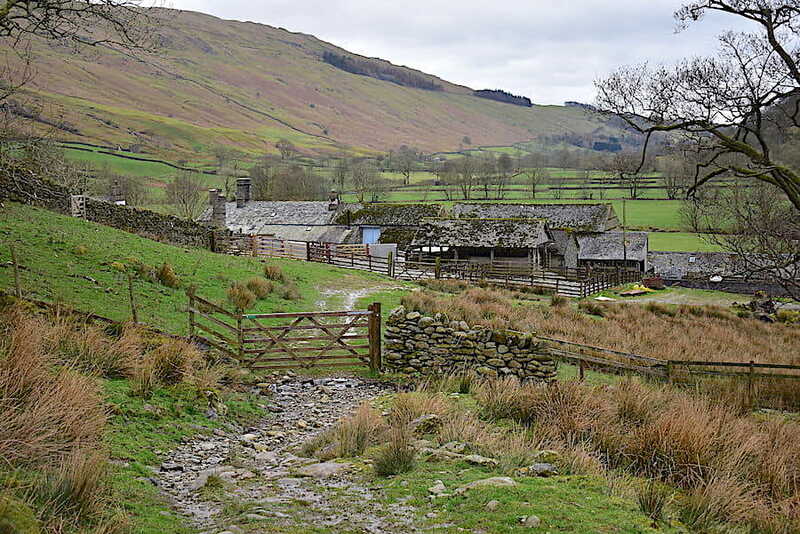 The farm buildings recede as we climb away from them and make our way to the bridleway above Hagg Gill. 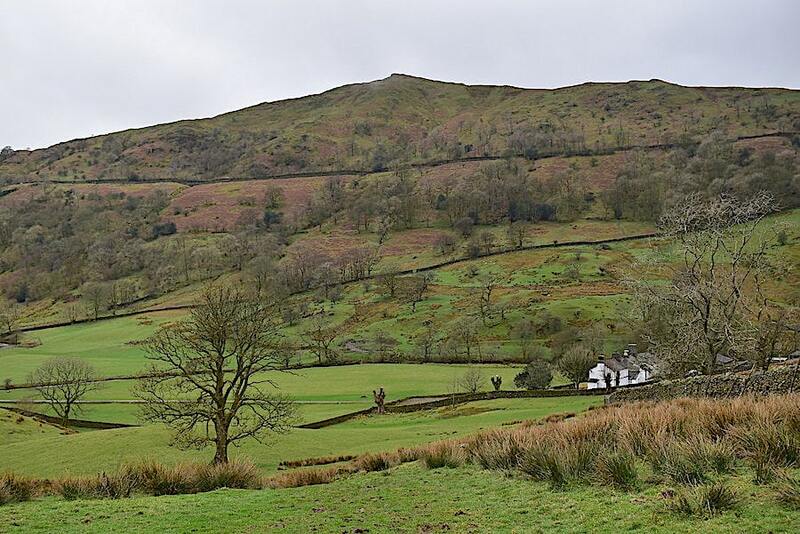 On the skyline is Dod Hill, a minor hump close to Baystones on Wansfell, with the long wall below it indicating, and hiding, the path of the A592. 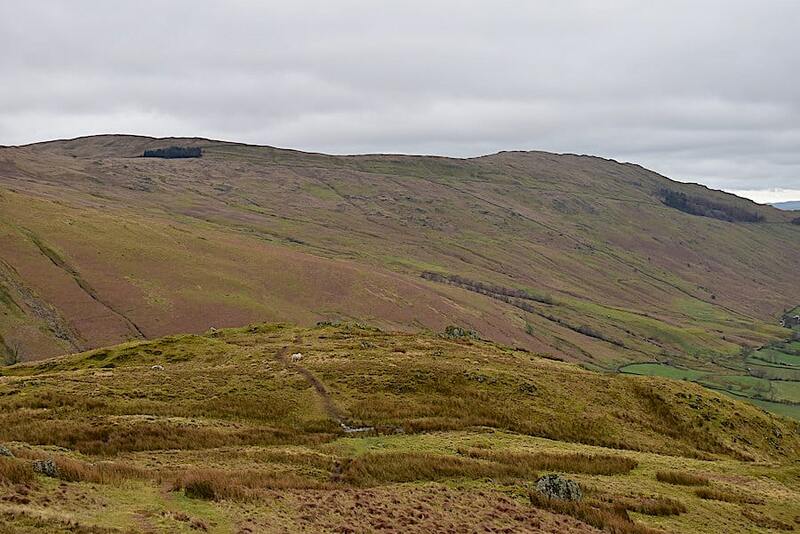 The summit of Troutbeck Tongue is over on the left as we continue on along the bridleway with Hagg Gill below us to our right. Looking ahead we can only come to the conclusion that the cloud base has become much lower now. Its is still very close and muggy and even walking steadily has us both beginning to work up a bit of a lather. I thought at first that it was my viral infection giving me one of those sweating interludes but on checking with J he was feeling just the same. We’d already removed our jackets way back at Hagg Bridge because it was so mild in the valley. A peep down to our right to where the footbridge, linking the old quarry road on the other side of the valley with the path we are on, crosses Hagg Gill. We’ve just had a few minutes chatting to the farmer who came towards us on his quad bike. He’d been putting out some hay for his sheep further up the valley so we got onto lambing, as you do at this time of year, and he mentioned that his lambs aren’t due until 24th April so the ewes still need their extra food. He also mentioned that his wife had been suffering recently with the same viral infection as myself so I asked him how long it had taken before she was better. He had to think a bit longer about that though and ended up saying that he thought it was about three weeks. A interesting difference of certainty with regard to the two events, I thought. 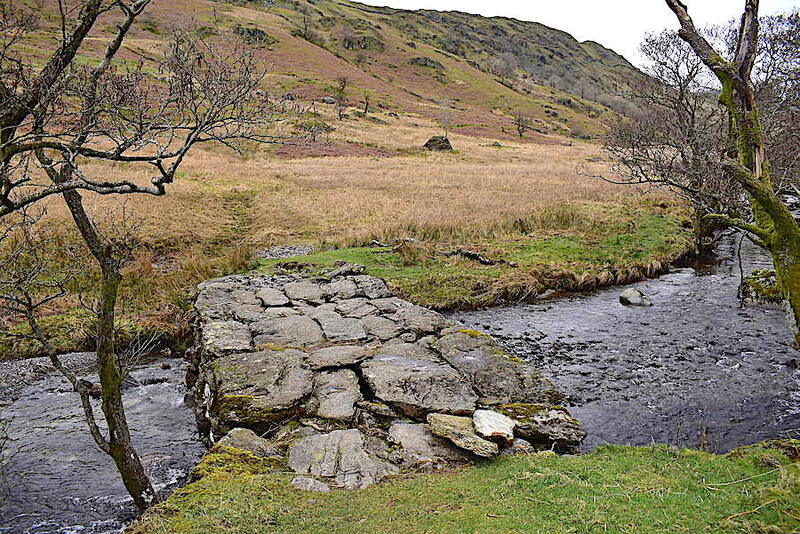 The ford and footbridge crossing Hagg Gill. The grand old barn reminding me very much of the ones I would see in the fields around my childhood home in Yorkshire. It didn’t last very long but it was nice while it did. We were hoping that the cloud was beginning to break up and disperse completely but it didn’t and within a very short time we were back to square one again. The appearance of a bit of blue sky and some sunlit slopes always has an uplifting effect though no matter how brief it is. 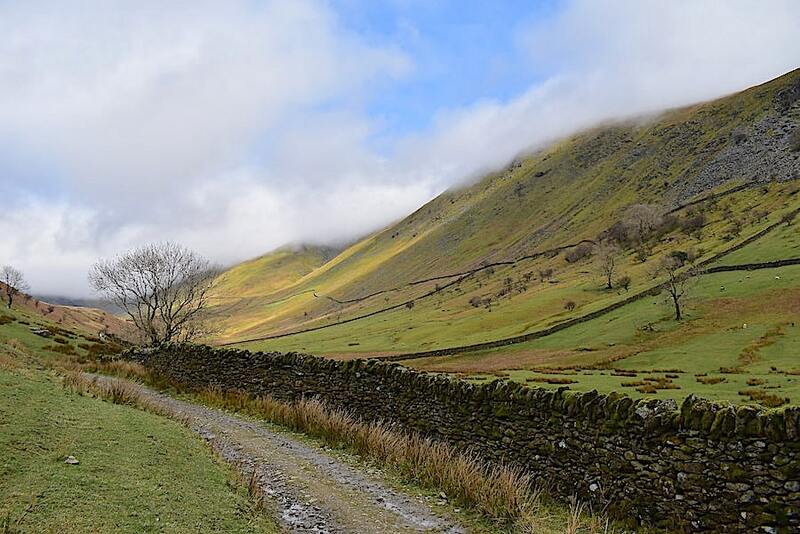 We’re almost at the point at which we’ll turn away from the valley and begin to climb the gentle northern slope of Troutbeck Tongue so I turned around to take a look back along the length of it. We could have turned off at the point where the wall, running diagonally across the slopes behind the occasional trees, meets the valley path and which gets you up to the summit ridge much quicker. 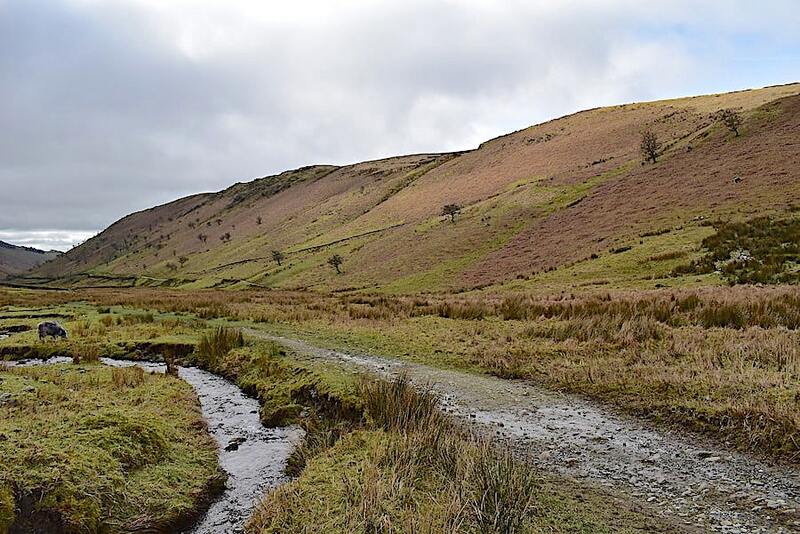 The downside is that it chops off a good chunk of the ridge route which, for us, is an essential part of the walk, as is the wild isolation of this part of the valley. 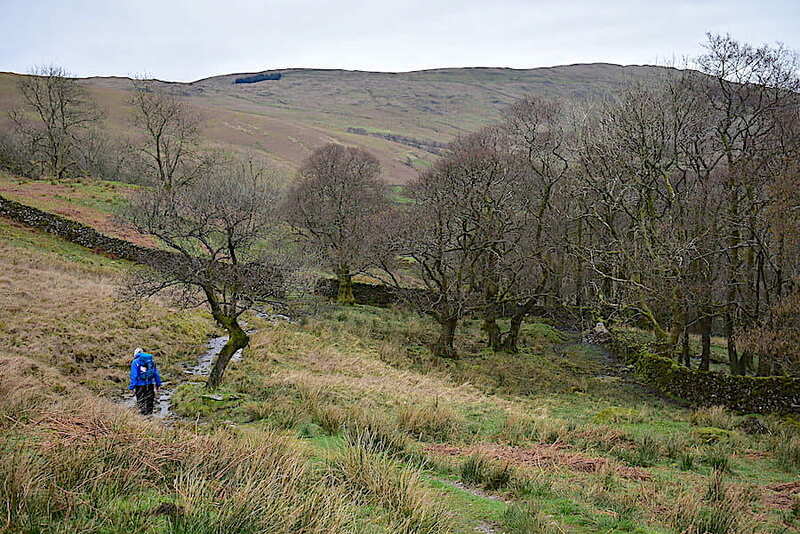 The track comes to an end towards the upper end of Hagg Gill and becomes a green path which we follow for a little while longer. 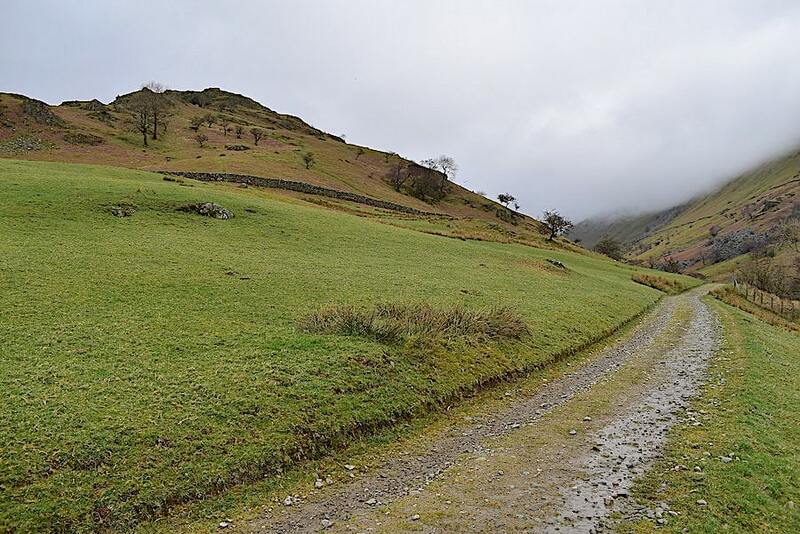 As the green path turns to climb towards the wall ahead we begin to bear left towards the northern end of Troutbeck Tongue. Before we head up to the ridge though, a cluster of flattish outcrops provides us with a suitable spot for a coffee break and a good vantage point from which to view the Scot Rake route up to Froswick. The green path can be seen alongside the section of wall rising up the fellside. 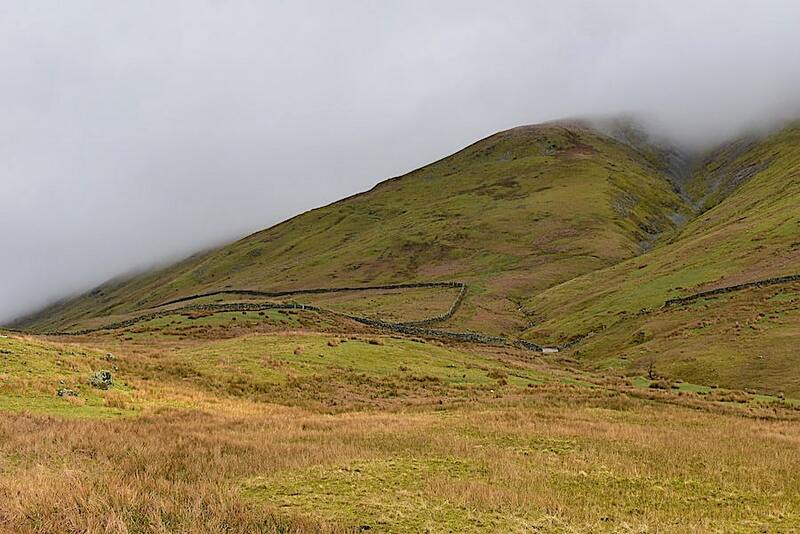 The wall eventually veers off to the left but the green path continues on upwards for a short distance before it too veers off to the left, across the western slopes of Froswick, before disappearing into the mist about half way up the slope silhouetted against the cloud. On a better day Thornthwaite Crag would also be visible behind Froswick. 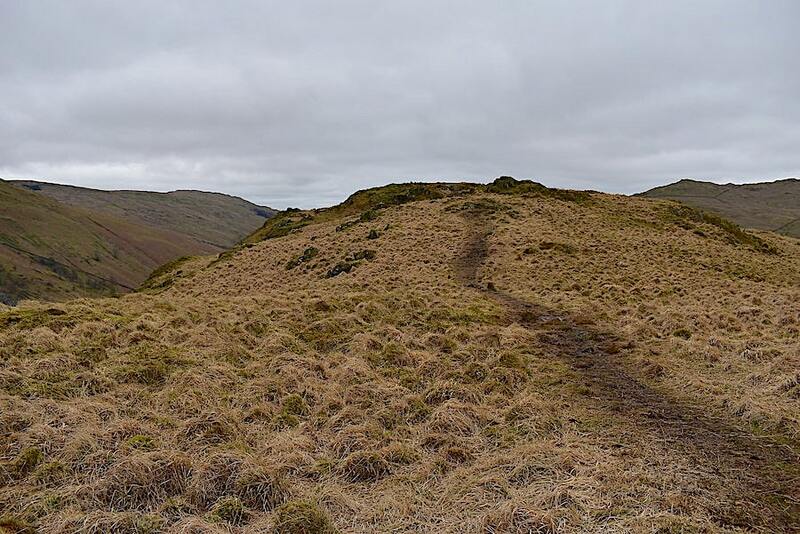 Its a steepish climb but is straightforward to follow and eventually leads to the ridge line between Thornthwaite Crag and Froswick. 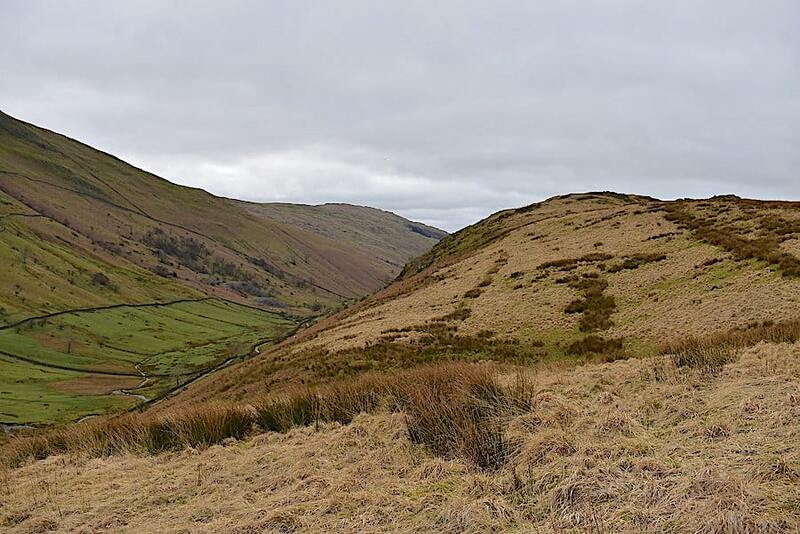 On the right of the shot is the deep ravine of Blue Gill containing the main feeder beck of Hagg Gill. We made our way up to the little col at the northern end of the Tongue from where I took this shot looking towards the head of the valley where even the much lower tops of Broad How and Doup Crag coming down from Stony Cove Pike are catching the cloud. As we started to climb away from the col a quick look back gave a brief but clear glimpse of Threshthwaite Mouth situated at the head of the valley between Stony Cove Pike on the left and Thornthwaite Crag on the right. The shot shows how gentle the climb up to the ridge really is and J’s assistance in dragging me up it didn’t need to be called upon despite my present breathing handicaps. I’m longing to get back to normality again because this constant nose-blowing and coughing is really beginning to get on my nerves now. You really shouldn’t have to take a dozen or so handy packs of tissues with you just to go out for a few hours, but they really are essential just at the moment. That apart, the most troublesome part of the walk across was the sheer wetness of it all but it wasn’t at all surprising given the amount of rain we’ve had lately. This, and other structures dotted around, have intrigued me ever since we first came across them so I did some looking around to try to find some information. 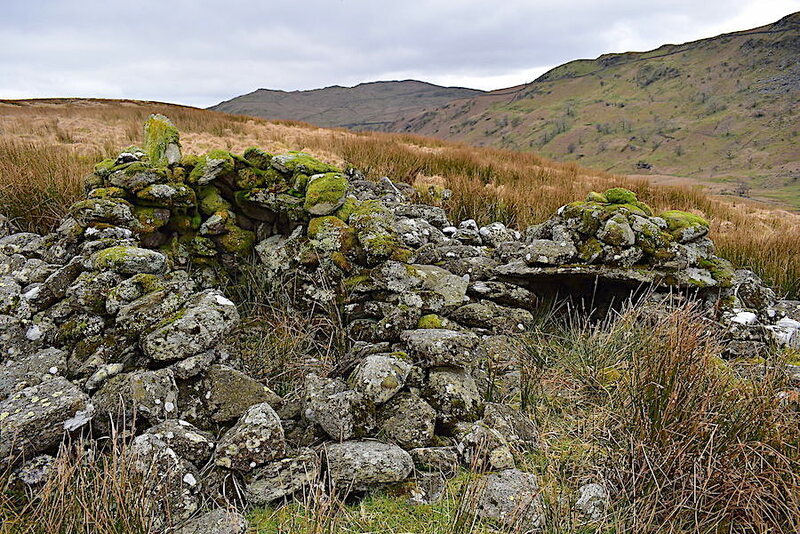 In 2017 the National Trust commissioned a survey of early settlement sites on the Tongue to evaluate the condition and extent of several Scheduled Monuments to inform on land management and on a programme of vegetation control. 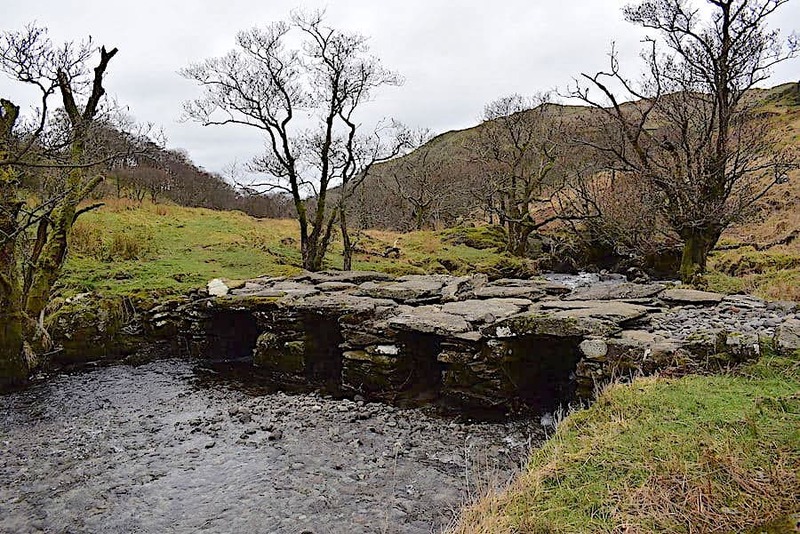 The survey found evidence of 68 sites on the Tongue, amongst which were prehistoric funerary round cairns, a mediaeval shieling, numerous charcoal burning sites, an 18th century slate quarry and a clapper bridge. One of the sites looked at in the survey was this one which is described as being a prehistoric round cairn, with a tall upright stone close to the cairn’s centre forming the eastern end of a stone filled cist (burial chamber), but which is now nothing more than a mutilated oval mound of stones. 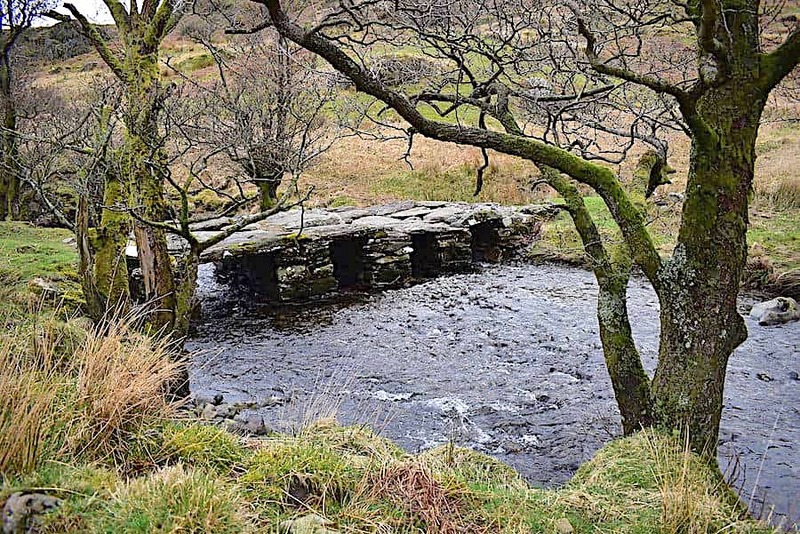 Two shelters have been fashioned using stones from the cairn and other large stones from the cist. 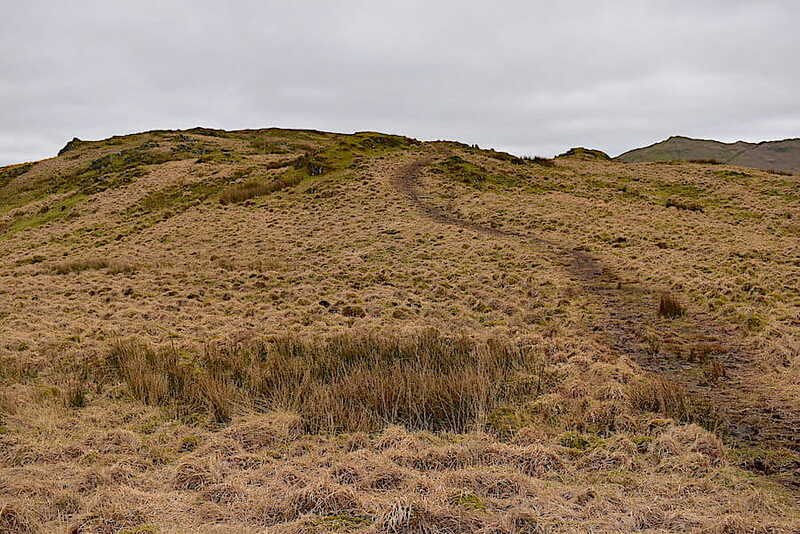 These are prehistoric Scheduled Monuments of high significance which the survey reported as being in poor condition with the recommendation that the surrounding reeds and other vegetation should be cleared. So the survey was carried out, and paid for presumably, and the findings and recommendations reported but the reeds and other vegetation continue to encroach and seemingly nothing has been done about it. This site looked more or less the same as it did the last time we came up here so perhaps it is fortunate that it is a little way off the beaten path and thus goes mostly unnoticed. There are numerous such sites of interest all over the Tongue but to the untrained eye, ours included, their significance is not always obvious and anyone walking across would not necessarily attach any great importance to a few stones hidden beneath the long grasses, other than to curse them when tripping over them or stubbing a toe on one. More importantly they should be left in situ and not used for shelters or way markers. 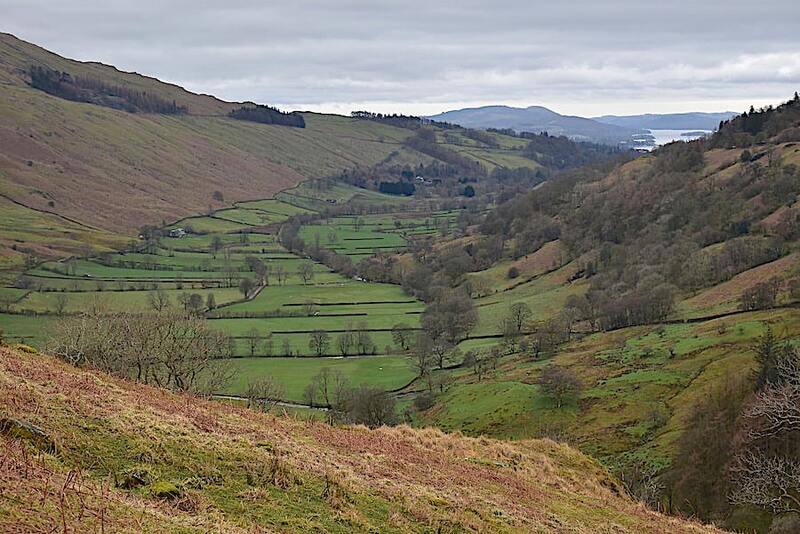 Here I wandered over to the Hagg Gill side of the Tongue for this view down the valley towards Sour Howes at the far end. 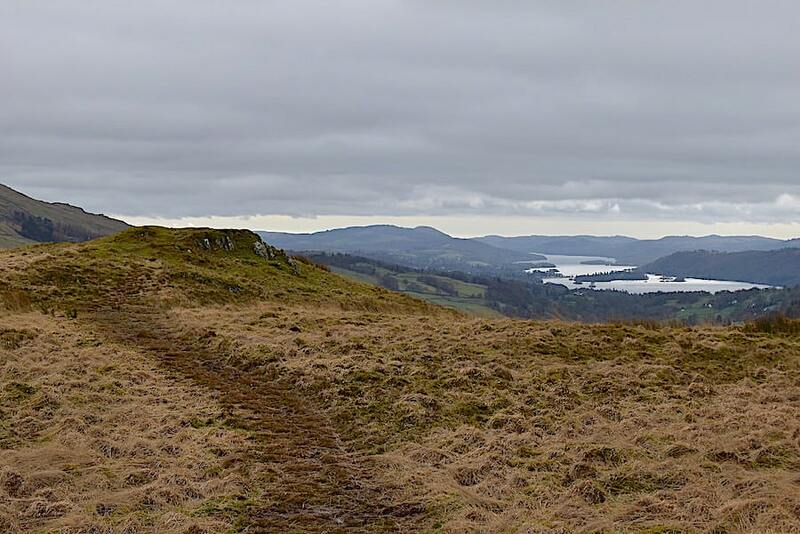 Still making our way over the ups and downs …..
….. and the very soggy path all along the route until …..
….. Windermere eventually comes into view and still manages to provide a silver sheen despite the very low cloud. 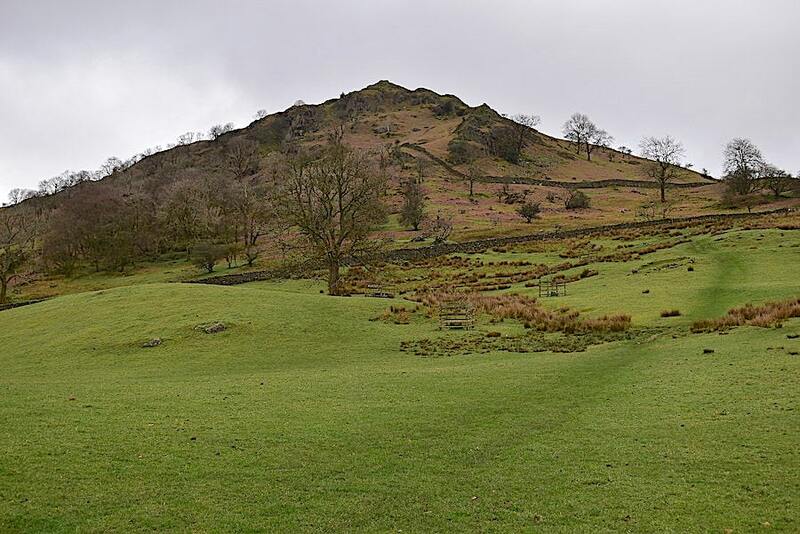 We make our way over to the outcrop ahead from where …..
….. the Tongue’s summit cairn is perched on the lower hill just below us. We are obviously standing on a higher point but the cairn is sited on the better viewpoint which gives an uninterrupted view along the length of the valley. Across the valley on the Trout Beck side is Baystones on the centre skyline, flanked by Dod Hill to the left and Idle Hill to the right. 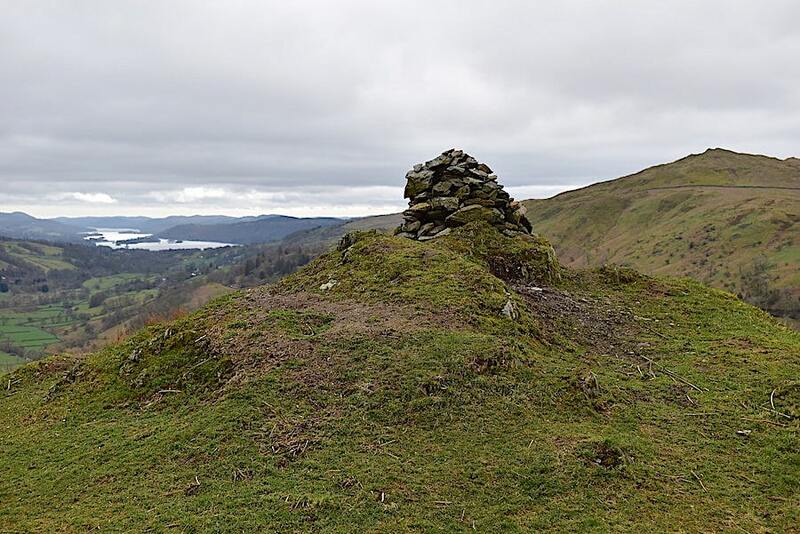 Windermere, Troutbeck Tongue’s summit cairn and Dod Hill. 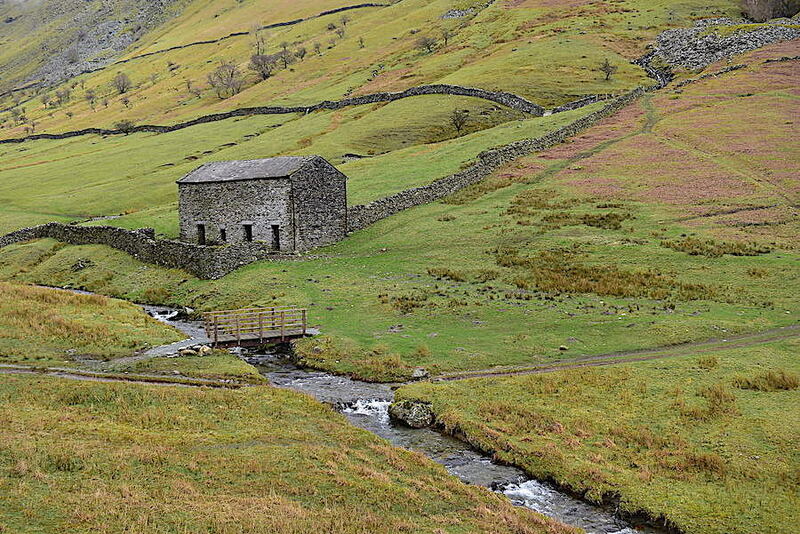 On the skyline on the Hagg Gill side of the valley are Sallows and Sour Howes. We decided that from the summit we would head down to Trout Beck rather than follow the usual route down the south ridge. 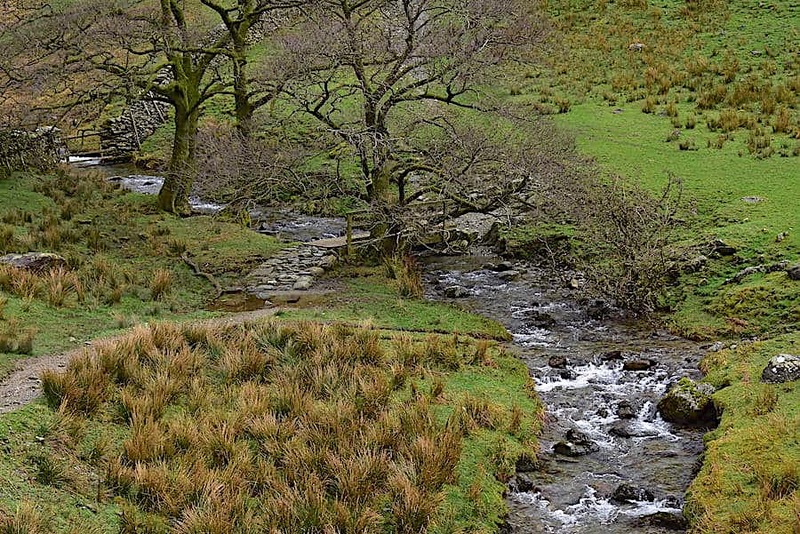 If you peer closely enough the white waters of the beck can just be seen amongst the trees. 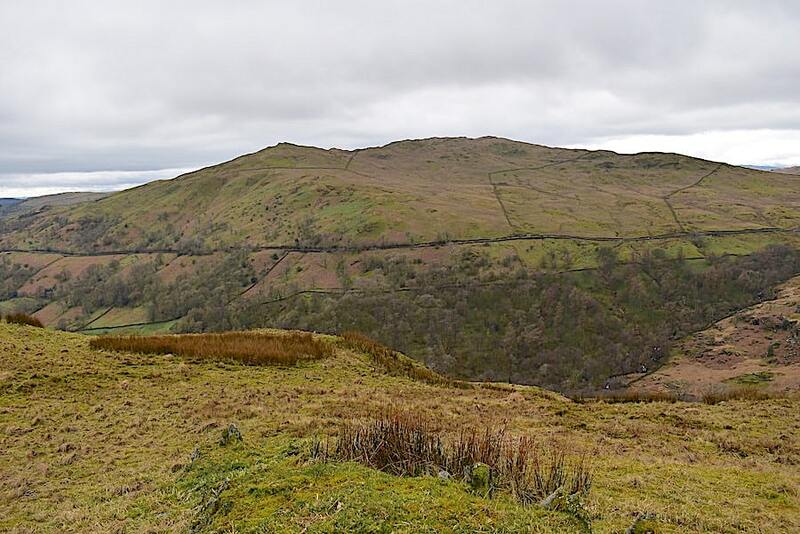 We didn’t follow a path but the descent through the dead bracken was straightforward enough …..
….. with a lovely view of the valley on the way. 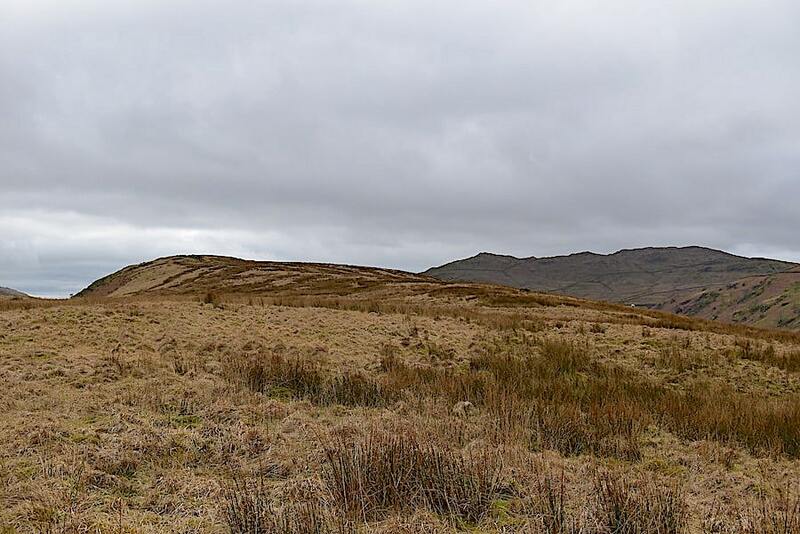 The trackway mentioned in the survey can be seen in this shot at the far end of the bridge and it appeared to be tracking, hairpin fashion, upwards towards Low Great Knott. 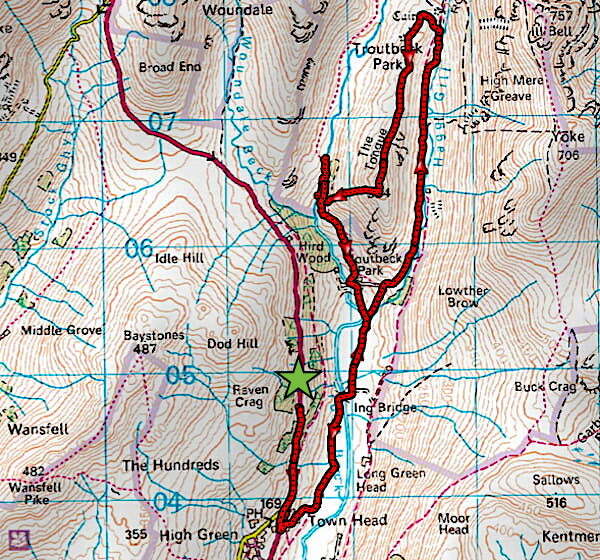 The OS map also shows a route turning off to the right and leading up to Threshthwaite Mouth at the head of the valley. That might be a very soggy route if the ground over there is as wet as it was over here. 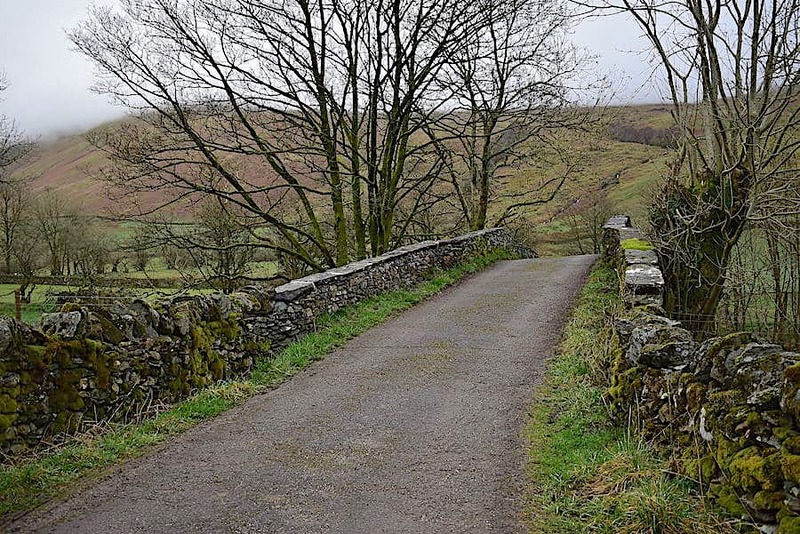 We took a break at the bridge, broke out the sandwiches and briefly considered following the track across the bridge, making our way up Low Great Knott and then heading for the track above Hird Wood which runs parallel to the A592 and returning to the car by that route. In the end we didn’t but its on the list should we get a long enough dry spell to allow the ground to dry out a little more. 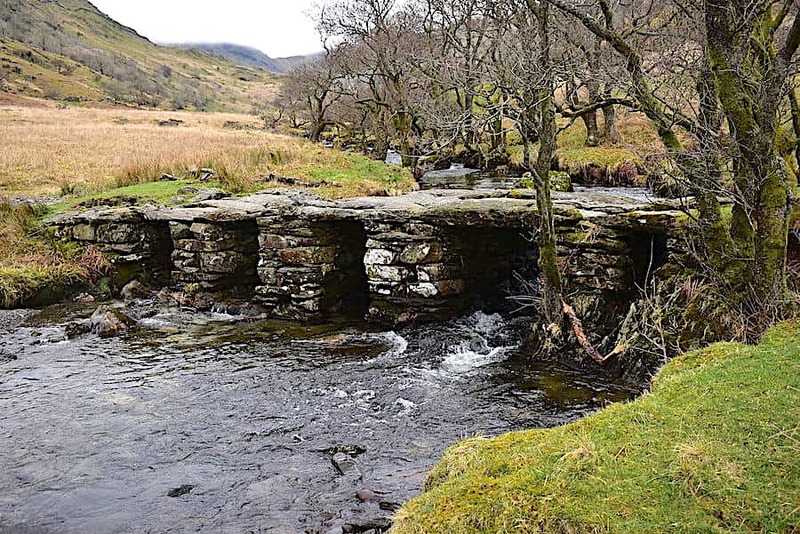 Viewing the bridge from the western side of the beck and …..
….. then back across to the east side for this view a little further upstream. 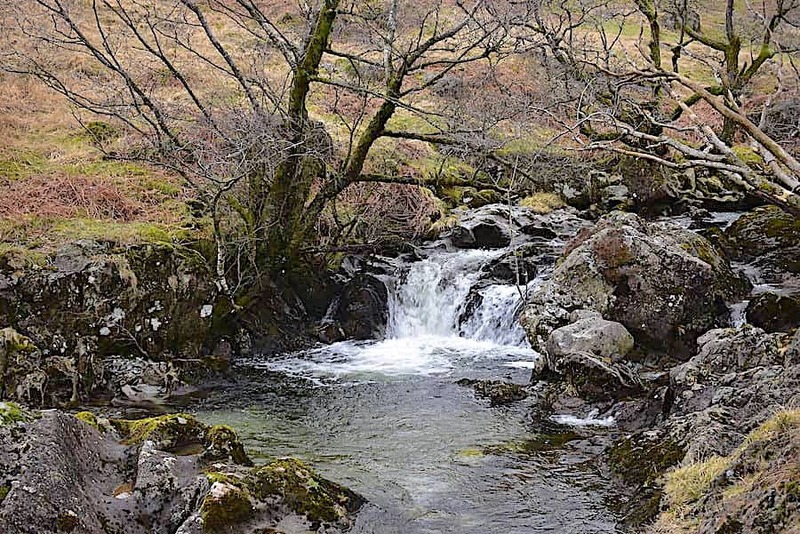 One of the more accessible falls in Trout Beck. There are plenty of them but some of the longer and more spectacular drops are difficult to take shots of since the water is forced through deep and narrow clefts of rocks which are difficult to access. 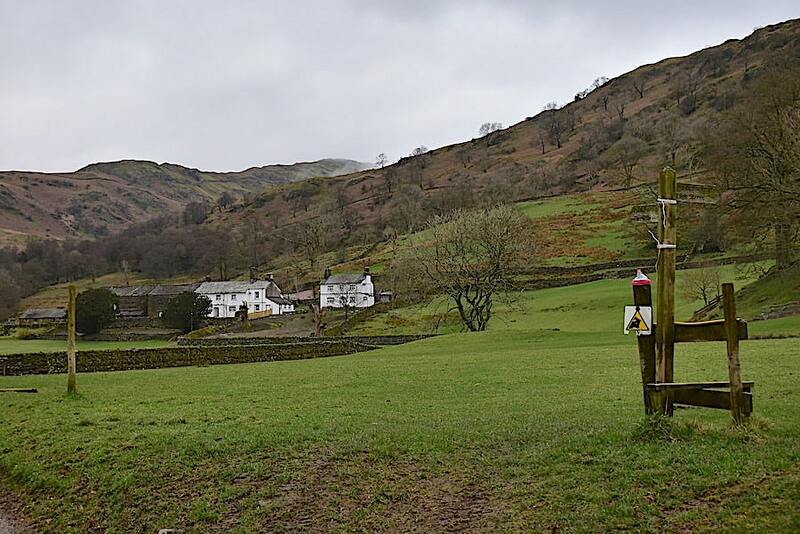 After our break we take to the watery path once again and begin making our way back to …..
….. Troutbeck Park Farm and the certainty of dry ground beneath our boots for the walk back along Ing Lane. 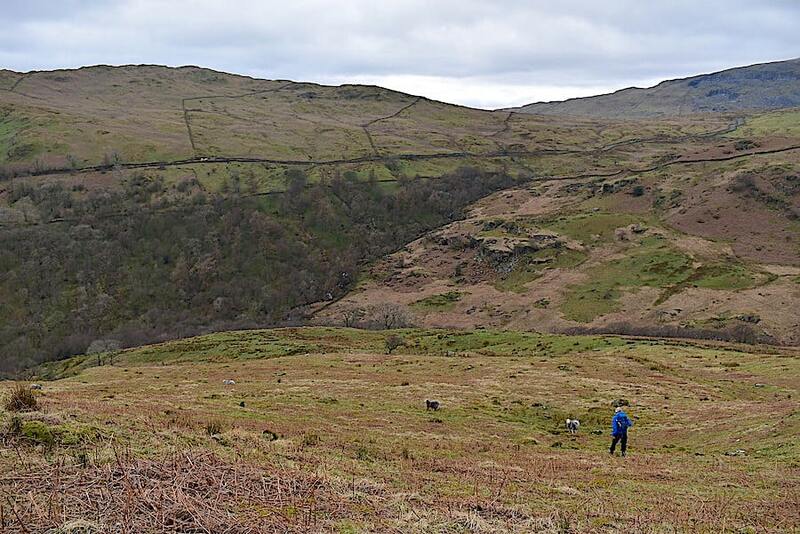 A look back at the farm and Troutbeck Tongue as we reach Ing Lane once again. With solid ground under our feet once more we make swift progress along the valley floor. The two lines of trees on the hillside mark the course of the Garburn Road and the location of the former quarry on the slopes of Sour Howes. 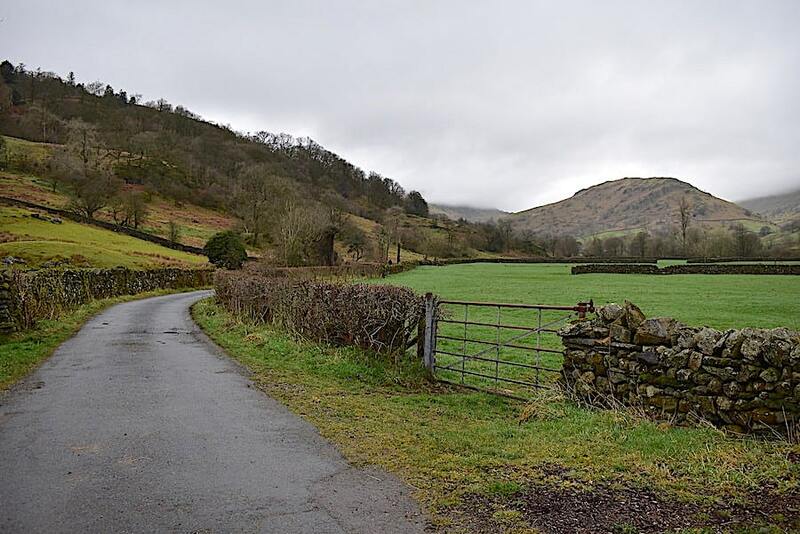 A look back along Troutbeck before the view disappears. 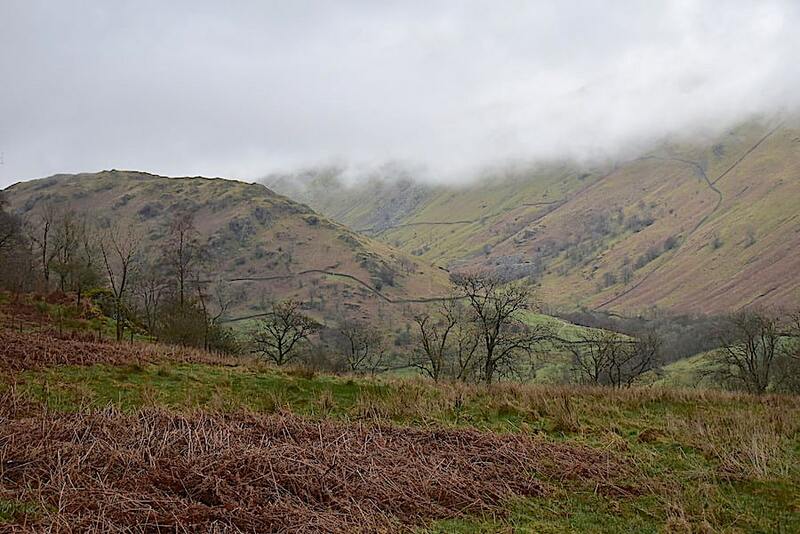 The fell tops were hidden in the cloud throughout the walk but the air remained mild and still, and despite the gloom it was a very pleasant walk back. 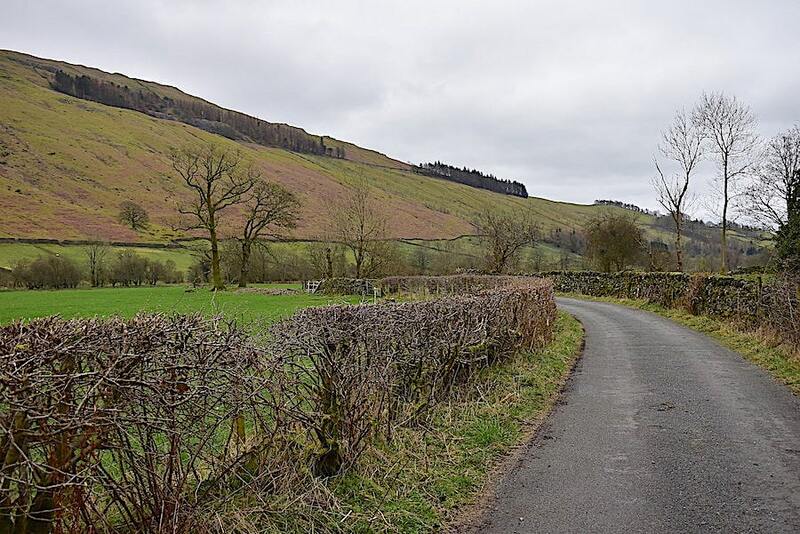 If we had been returning to Troutbeck village we would have turned left here along Truss Lane and then to the field path beside the A592 back to the church. As we started from Town Head we keep to the right and walk the short distance up the hill and back to the little hamlet. A couple of the attractive houses we passed as we walked through Town Head. 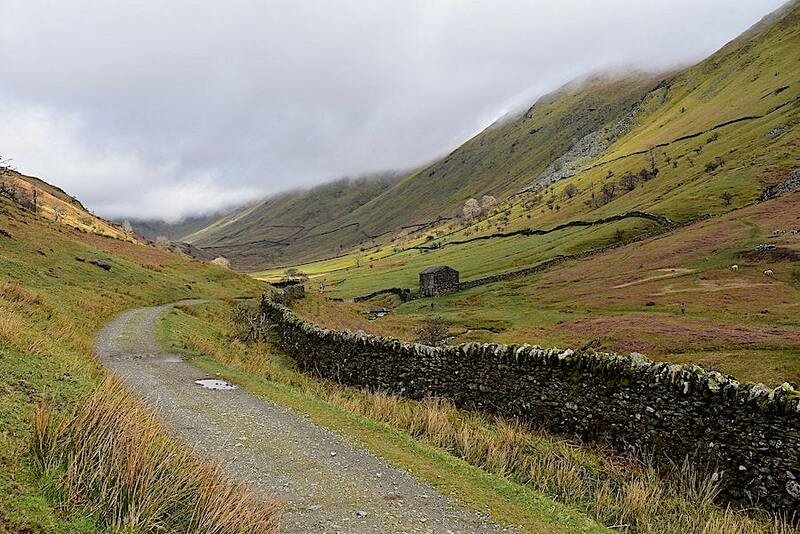 The A592 and The Queen’s Head Hotel are just a few yards behind me and where my walk will come to an end. We turn back up the lane and cross over the A592 to the hotel, where J has decided he’ll leave me sitting on one of their benches, baby-sitting our two rucksacks, while he dashes off back up the road to get the car. He has to drive it down to this point anyway, it wouldn’t be sensible to try and turn it around from the lay-by where we’ve parked it, the road is too narrow and too busy to bother with the faff of that. I don’t mind sitting on a bench looking after rucksacks one little bit, especially as there’s a section of steep road to deal with between the hotel and the lay-by which, with my current breathing limitations, I wasn’t looking forward to at all. Not weighed down with either a pack or breathing problems he was back in just over ten minutes so I’d hardly had time to get settled and comfortable before it was time to sling the packs into the boot and climb in for the drive back home. Being outdoors again was lovely and it was such a gentle walk that I never really had to struggle for breath anywhere along it. I really hate being below par and feeling so debilitated but all I can do is be patient, sit it out and hope that my immune system deals the killer blow to this wretched virus before very much longer.